When I moved to Shelburne when I was 4, one of the girls that lived on my street came knocking on our door to meet me. She said she had heard there was a little girl living there. We still keep in touch although we don't live on the same street anymore! 2. Who are your people? I have lots of friends/acquaintances from different places but not one big group of friends. I have friends at work, my neighbours, and from university/Nova Scotia. I have also been lucky to meet people at my workout class and the parents at E's school. I wrote about that couple of years ago here. We usually have a special meal with a nice bottle of wine, and I will buy a few small gifts usually with a red theme. 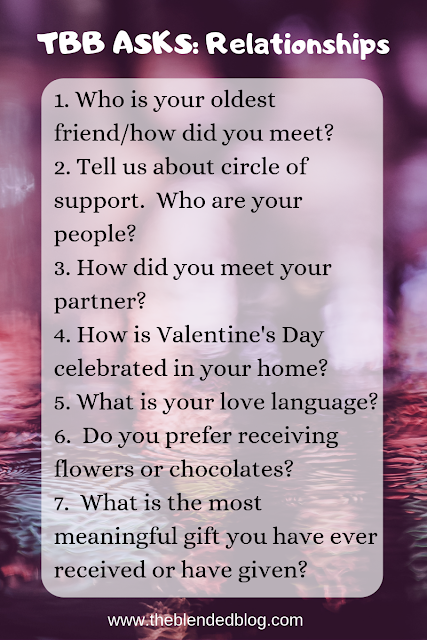 I've never done this quiz but I guess there are five (acts of service, words of affirmation, receiving gifts, quality time, and physical touch). I don't know exactly how this fits in but my love language is someone making food for me or taking me out to eat (so that's probably a combination of acts of service and receiving gifts). 7. What is the most meaningful gifts you have ever received or have given? When E was born Dave got me a Tiffany bracelet and when Q was born he got me a charm to add to it. I don't wear it all of the time but it is definitely the most meaningful item! That bracelet certainly is a wonderful gift! The love language quiz is a good one for sure! Food for the win! Love it. Thanks for linking up with us.